One of the biggest complaints most of you have about spherical ice molds are the inconsistency of the spheres. Some spheres turn out cloudy rather than being perfectly clear balls of ice. Other spheres crack during the freezing process, leaving you with ugly ice spheres that break apart when they melt down. 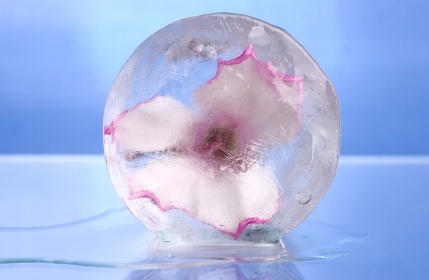 And if you use some molds, you can end up with a “ring’ around the circumference of the ice sphere. If you have a crap mold, don’t be surprised when you get crap ice. Cheaper silicone trays usually come in two flimsy pieces (one top and one bottom) that are hard to fill with water. Once they are actually filled, the top piece ‘floats’ a little. As the spheres freeze, you are left with an ugly, rigged ring around the ice sphere. All bad. Cheaper molds also break down fairly quickly and can leave leak chemicals from the silicone into the ice. Not good. You don’t need to shell out $1,000 for a space age ice mold. We have tested the top 20 ice molds on the market and have narrowed them down to two based on price and performance. Starting out right gives you the best chances of finishing right. These molds are relatively inexpensive, last longer than a year, and give you the desired results with minimal fuss. Click on either image above to get one for yourself. If you are a purist like me, you pursue perfection. While that was my primary motivation for experimenting with clear ice, there are reasons why it should matter to you as well. Cloudy ice comes from impurities in the water. Normally, these impurities are dissolved into the water in its liquid form and are invisible to the naked eye. When ice freezes, these impurities separate themselves from the liquid and become visible. Impurities normally found in tap water – such as chlorine, pipe rust or plastic, dust, and fluoride can negatively impact the taste of your ice and ultimately your whiskey. Do you really want to ice that tastes like bleach and rusty pennies to your bourbon? Thought not. 1. Boil the water first: You will be able to get significantly clearer spheres of ice if you boil tap water before freezing it. Pour the water into the mold while it is still hot. The slower the freeze, the clearer the ice. Let your molds sit in the freezer longer than the recommended time of 6 hours and you should be good to go. 2. Use distilled water: Using distilled water not only minimizes the numbers of impurities in your ice sphere, it also ensures that you taste nothing but your bourbon as your perfectly clear ice sphere slowly melts. An issue you may come across is getting your ice ball out of its mold. It took me a few tries and a little frustration before I figured out the trick to getting the ice out without damaging the sphere. For starters, ensure the mold is properly filled. In the case of the Tovolo molds, add water past the fill line in order to fill the mold and not have a flat spot at the top of the sphere. When its time to release your spheres, run the plastic (bottom) part of the mold under hot water until you can free the sphere with the rubber top attached. Then you will be able to remove the sphere from the top with ease. I highly suggest you start with the bottom of the mold rather than the top – it takes just a little longer to get the soft silicone to release than it does the hard plastic part of the mold. You can also try letting the sphere sit at room temperature for about three minutes after removing it from the freezer if you would rather not run hot water over your mold. Once you get the system down, go crazy. Experiment with adding foreign objects to your sphere to enhance your cocktail. Try hollowing out your ice balls and filling them with orange juice or bitters. 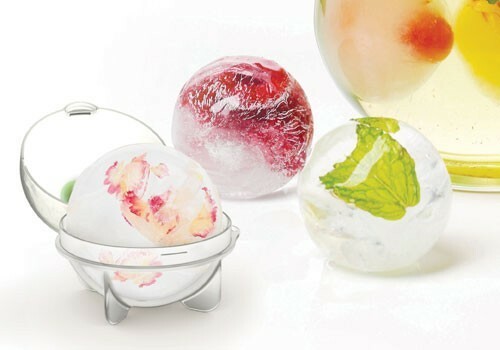 Make some LED ice balls (see the how-to video here), add flower petals, or bits of fruit. I wouldn’t recommend putting some of these creations in your bourbon, but there are tons of applications for other cocktails, drinks, or artisan culinary creations! Here are some examples. If you have your own creations or suggestions for how to get the most out of ice molds, leave them in the comments section below. Why is all my ice spheres coming out of the mold with cracks in them. I have done about 2 dozen or so in different ways. using tap water, filtered water, bottled water with same results. They are all coming out cracked! Is it my cheap molds? This has happened to me before! What kind of molds are you using? Why do I feel so “stupid” asking this question BUT what is the best way to fill these up…….not even going to tell you how I have tried to do it!! The best way I’ve found to do this is to make sure the container is securely closed, open up the top of the container, and pour water into the top, filling it to the brim and then closing the top plastic piece. That way you get a complete ice sphere that will look beautiful once it freezes. Thanks for reading!